I shall just leave this painting as it is. I have kind of lost my motivation to continue this piece cos the trees confuse me for some reason. ): I guess I got quite tired of painting trees. >< Well, this is an "abandoned" piece of work. I have stopped painting this piece a few months back to paint "AUTUMN"(my 4th oil painting), and even after I finished painting AUTUMN, I started painting a new painting while trying to do finish this piece. I am a weird person. I guess that the work is not that bad as I thought, but it just differs too much from the original reference picture. What I really like about this piece is that this is my most textured piece. The fig trees were created using thick application of different colours and tones of paint. It is very very heavily layered, so I think that the spontaneity and the somewhat 'arbitary' application of paint makes the work special. p.s. pardon the lousy photo quality. (credits to Tze She for this photo). This was not exactly the starting point. But it was one of the initial stages of my painting. Well, the yellow and orange areas are done with acrylic. The snow was yellow at first but I started painting it with oils so it looks purplish blue now. I think that I can only go to the art studio after EOYS, or even after AEP trip cos there's higher chinese o levels. ): Boohoo ): I miss painting there. I like your painting very much! You have done a good job on highlighting the 3-dimensional quality of the pine trees and furthermore painted the sun in such an expressive manner. The luminous rays of the golden orb are fully portrayed over here by your skillful hands! Keep working on this fabulous artwork you have! However, I think it would be better if you include a subject matter. Currently, it is a landscape that is fantasized, with excellently rendered brushstrokes, but lack a specific area of focus. It would definitely be more interesting if you add some characters to your landscape. Hi Xin Ying I like your oil painting! I agree with your teacher that Winter is better than Autumn. Perhaps it's due to the use of a brighter palette and a more personalized color scheme compared to Autumn as seen from the way you add on shadows to those trees. Also, the light "circles" creates a really warm atmosphere together with the sunrise in the background. Just an opinion but maybe you could have chosen a more local scene or something that relates to you more. Perhaps this would allow you to portray your personal qualities/ personal style more than a mere depiction from the photograph. (Just my opinion because a think art making is about expressing yourself, but of course it differs between individuals :) Anyway, your skills are really good! 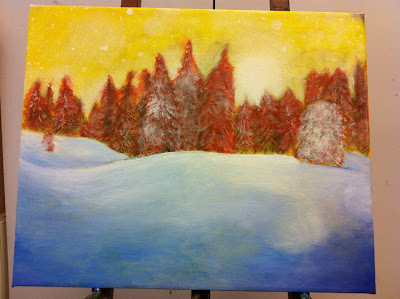 I like how you layered colors on and experimented along the way to find the best colors for your painting, seeing that you started painting red trees. I also like the three-dimensionality of the pine trees and the expressiveness of the sky. The red undertones of the trees seems as if reflected from the orange sky. I think you did a great job! However, I feel the snowy ground from the starting point looked better than the end product, I wish you could have kept it! This is because the ground had more variety of color instead of just being a flat white. This made it look more interesting.